This farm is located in the Gers: the area between Toulouse and Bordeaux in southwest France, the heart of Gascony. Also known as the "Tuscany of France" but also the land of d'Artagnan and the musketeers! The environment consists of rolling landscapes, distinctive scents and sounds, sense of timelessness, pure pleasure for all the senses, a variety of leisure and relaxation, and throughout the year new discoveries from one town to another! Very fun to make trips with the whole family, but "staying home" and lounging and swimming is also delicious. The farm has been renovated and is situated in its own grounds with a fenced pool with adjacent sun terrace with outdoor shower. 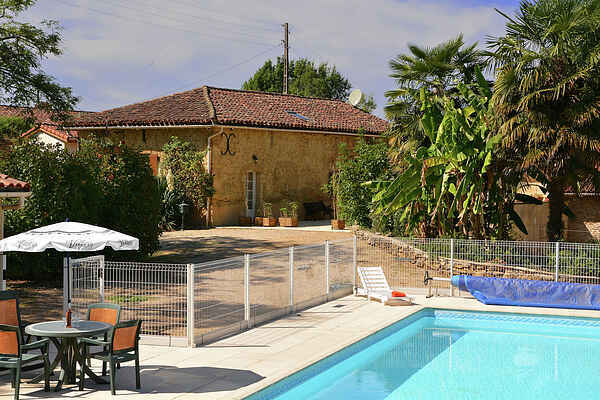 At the farm you will find a large terrace with a barbecue and in the garden trampoline and a table tennis table. Inside a large living room with an open kitchen. There are four bedrooms and two bathrooms; two bedrooms and a bathroom on the ground floor and two bedrooms and a bathroom on the first floor.